Start reading Salt, Fat, Acid, Heat on your Kindle in under a minute. 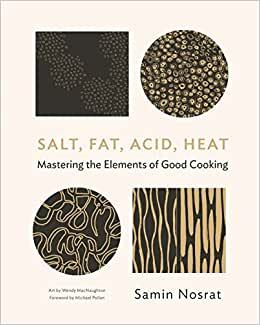 In this incredibly good book, Samin Nosrat explains the vital roles played by salt, fat, acid and heat in a lively, accessible way. 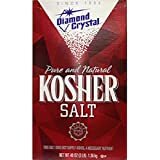 I’ve been under-salting for decades! No more. She presents a cornucopia of techniques for dealing with everything: vegetables, fruits, grains, legumes, pulses, eggs, dairy and meats. Her depth of knowledge is encyclopaedic and it’s a wonder she managed to squeeze so much in. A lot of the time she’ll present a basic technique, then describe how to vary it to produce dishes from all over the world. The first part of the book is about principles and the second is recipes - though a lot of the recipes are foundational principles too. For example, mayonnaise. Essentially egg yolk and oil, it can be varied endlessly to suit Mexican, French, Mediterranean and Asian dishes (to name a few). The wonderful illustrations by Wendy McNaughton also include handy charts summarising flavour profiles from round the world and charts showing what can be cooked how. Having devoured the Kindle version, this one is worth getting in hard copy, as it’s simply the best all-round reference book ever. From now on I’ll be salting meat the night before and not rushing the onions or the meat sauce. It’s really good to know the science (applied science really) behind what works best in the kitchen. 2.0 out of 5 starsWas a hard read. I wanted to enjoy this more than I did. There were too many stories, when I just wanted the facts. I got bored reading it and wasn’t really interested in the author, I just wanted the information that I could reference. I like the way this book is writen. it's intersting and easy to comprehand. Samin had managed to simlify cooking and the theory bhind it. A must read for every chef. 5.0 out of 5 starsBut this book.